Review: The DS 3 is Citroen's stylish new supermini - but does it live up to its looks? We took the premium supermini for a test drive to see just how well it handles on Irish roads. DS AUTOMOBILES IS the new premium arm of Citroen. This means that the Citroen DS 3 of old is now just the DS 3 – and it competes in the premium supermini segment against the likes of the Audi A1 and MINI. The DS 3 starts at €21,345. But this test car was the Prestige model, powered by a 130hp 1.2-litre three-cylinder turbo petrol engine mated to a six-speed manual gearbox. It will cost you €30,745. The DS 3 is a very stylish car with plenty of interesting exterior design elements that catch the eye – including a floating roof, two-tone body and roof colours, side body line with a shark fin and chrome accents on the sides and surrounding the grille. My favourite part of the exterior is the vertically stacked daytime running lights and the funky 3D LED rear lights. They make the car look even more snazzy. Inside, the cabin is just as fashionable with plenty of glossy surfaces, soft-touch plastics and soft leather. The front seats are large and seriously comfortable, with a good amount of adjustment. The seats in the test car were finished in a rich Nappa leather with ‘watch strap’ stitching, which gave the cabin a very classy feel – but that is a €2,500 option. All-round visibility is great thanks in part to the far back B-pillar but this does limit visibility for rear passengers and makes the back a little dark. Rear parking sensors come as standard and the €250 optional reversing camera is a nice added extra but unnecessary in a car this small with such good visibility. There is quite a lot of leg and headroom for those riding up front but although there are three seat belts in the back it is a tight squeeze for three adults back there. Having said that, rear seat passengers will have more leg room in the DS 3 than the MINI and more headroom than the Audi A1. The boot is nice and large though with a 285-litre capacity with the seats up. This is bigger than the MINI’s 210 litres and the Audi A1′s 270 litres. The cabin features a seven-inch touch screen (standard on both trims), from where most of the car’s functions are operated. However, the air-con controls are placed underneath this, as are the stereo volume buttons. This is quite confusing and a little annoying, as the stereo is operated via the touchscreen or buttons on a stalk hidden away behind the steering wheel. Furthermore, when you turn off the heating the ambient lights on the heating and volume controls go out, so you are left fumbling around in the dark to try and find the buttons. The other aspect that lets the cabin down for me is the lack of storage. There is only a small glovebox, narrow door bins down around your ankles, a small space under the volume controls, a narrow space in the armrest… and there are no cup holders. Not one. But for me, those little gripes disappeared once I started driving. You see, the DS 3 offers a decent, mature ride and although it looks like a city car, it feels at home on windy country roads and motorways, too. The 1.2-litre 130hp engine is a pretty perky performer and delivers 230Nm of torque from just 1,750rpm and supplies generous amounts of torque over a broad powerband. This, combined with the long throw manual transmission, means quick starts, easy overtaking and being able to let the car rev a little bit longer than normal. I really like the suspension set-up too as it is a little taut. The car handles really well, too and is surefooted and confident on corners. And I liked how weighted the steering felt. It has a nice bit of give and feedback, and isn’t too light as some small cars tend to be – and yet it is still easy to manoeuvre. Is this the right car for you? If you are looking for a car with lots of character and good value for money in terms of spec but storage isn’t that much of an issue for you then the DS 3 could be the car for you. However, if you are just after a car that’s really fun to drive, with a great chassis and engines and you don’t care about passenger or cargo space then take the MINI Cooper for a test drive. Want a car that is light and easy to drive, comes well specced and you have a bit more money to spend? Then check out the Audi A1. If you need something cheaper but still has character and personalisation options, then check out the Opel Adam. 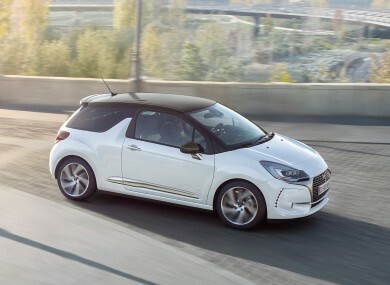 Email “Review: The DS 3 is Citroen's stylish new supermini - but does it live up to its looks?”. Feedback on “Review: The DS 3 is Citroen's stylish new supermini - but does it live up to its looks?”.